If you rupture your Achilles tendon or break a bone in the ankle, there is no mistaking that something is wrong. In almost all cases, you will experience considerable pain and possibly even hear a pop or snap. But what about those lower extremity injuries that don’t have an obvious point of origin or result from a traumatic incident? One such type of injury is Achilles tendonitis (or Achilles tendinitis), a condition that’s characterized by inflammation of the Achilles tendon due to overuse or progressive degeneration. While this condition may not produce the excruciating pain that a fracture or Achilles tendon rupture does, it often produces pain, stiffness and tenderness that can seriously impact quality of life, particularly for active individuals. Moreover, a weakened Achilles tendon is more susceptible to tearing, so it is critical to seek treatment before the condition causes long-term damage. NY-based orthopedic foot & ankle surgeon, Stuart Katchis, M.D. regularly treats patients ranging from serious athletes to weekend warriors who develop Achilles tendonitis. Here he explains the symptoms you are likely to experience if you have Achilles tendonitis, risk factors for the condition and how it is diagnosed. Sometimes, patients with Achilles tendonitis may see a physical hardening of the tendon that often presents as a raised bump when looking at the tendon from a side view. Extra bony growths called bone spurs are also possible for those patients who develop insertional Achilles tendonitis, which specifically affects the area of the tendon where it attaches to the heel bone. 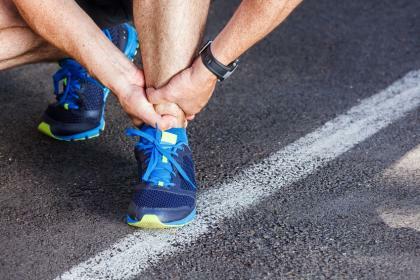 Most cases of Achilles tendonitis result from sports-related activities, particularly sports like tennis, basketball, soccer and squash that involve running, jumping and sudden starts and stops. The condition occurs due to repeated stress on the tendon, so athletes who quickly increase activity without giving the body time to adjust, such as increasing the length and duration of runs, are at a higher risk for Achilles tendonitis. In addition, middle-aged “weekend warriors” who participate in the same sport over a long period of time are also at risk since these activities can place continual, long-term stress on the Achilles. Age – The Achilles tendon weakens with age, making middle-aged to senior athletes more prone to tendonitis. Physical conditions – Conditions including tight calf muscles, a flat arch and obesity can all increase the pressure exerted on the Achilles tendon. Worn out running shoes – Shoes that are worn out cannot properly protect the Achilles tendon and absorb the pressure exerted when running. Antibiotic medications – Taking certain prescription drugs in the popular antibiotics class of fluoroquinolones (including ciprofloxacin and levofloxacin) increase the chances of tendonitis. Achilles tendonitis is diagnosed by a thorough physical evaluation during which the lower leg will be examined for swelling, pain and any thickening along the tendon. The physician will gently press along your injured tendon and ask you to identify where the pain is most intense. The examination also involves evaluating your flexibility, alignment and range of motion. In some cases, additional imaging via X-ray or MRI may be required to make a full diagnosis. This is often necessary when insertional Achilles tendonitis is suspected, as it may involve bone spurs (extra bone growth) around the heel. Imaging may also be necessary in cases where hardening or calcification of the tendon is suspected. If you are experiencing symptoms of Achilles tendonitis, call our office at 212‑434‑4920 or schedule your consultation with Stuart Katchis, M.D. by filling out the form on this page. Extend Orthopedics offers locations in Scarsdale (Westchester County) and Manhattan, NY. To learn more about nonsurgical Achilles tendonitis treatments and Achilles tendon surgery options offered by Dr. Stuart Katchis, visit our Achilles tendonitis page.